Riding on the back of a scorching July featuring the UK airshows at Yeovilton and Duxford Flying Legends, it was typical that the world's largest military airshow would hit a low. With overcast skies playing havoc with the flying display schedule on the Sunday, the Royal International Air Tattoo 2010 did get a break though - in the shape of a glorious Saturday afternoon. Around 155,000 people visited RAF Fairford over the two days to help celebrate the themes for this year's Air Tattoo : Cadet 150, Training 2010 and the 70th Anniversary of the Battle of Britain. Ian Matthews reports from showery Gloucestershire. 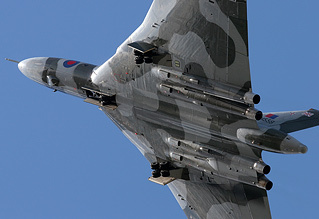 Photos by the UK Airshow Review team. 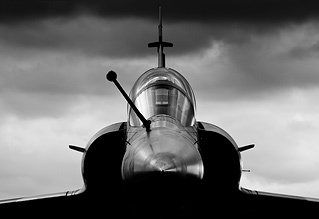 In total, 246 aircraft took part in RIAT 2010, from 30 air arms representing 17 nations. 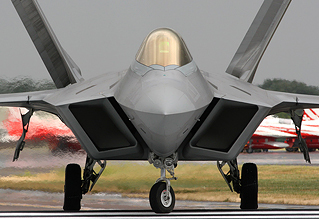 But there was one aircraft most had come to see, the return of the USAF fifth generation fighter, the Lockheed Martin F-22A Raptor. Four Raptors wearing the markings of 3rd Wing at Elmendorf AFB, Alaska landed at RAF Lakenheath on the Monday evening before the show. Two F-22s repositioned to Fairford on the Thursday to rehearse their display and become acclimatised to the changeable Gloucestershire weather. It was to be a busy couple of weeks for the Raptors supporting RIAT, Farnborough plus sorties with the Lakenheath Eagles. Although there was no F-22 in the static display, there were some welcome examples of types that are nearing the end of their operational lives and might not be seen at the next Air Tattoo. RAF Tornado F3, USAF T-43A Gator, Polish Su-22M-4 and German F-4F Phantom contributing to a 97 strong static aircraft line-up. Other notable highlights included P-3C Orions from the German Navy and US Navy with the latter also contributing a rare E-6B Mercury. 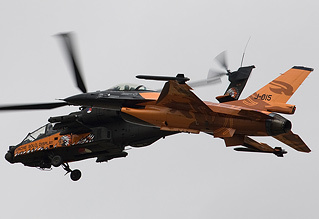 The Jordanian and Omani AF Hercules looked stunning in their desert schemes but it was the tiger tailed F-16BM Fighting Falcon from 338 Skv of the Royal Norwegian AF that won the RIAT Concours d'Elegance award for best livery. 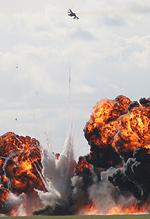 The RIAT 2010 flying display got off to an uncharacteristically quiet start on both days. With the morning weather and serviceability not being kind to the Altus based team of C-17 and KC-135R, it was up to the RAF to continue the Training 2010 theme with RAF Tutor, Tucano and Hawk flying their usual polished displays. Continuing the training theme further RAF Typhoon display pilot Flt Lt Tim Clement used a two-seater T.1 for the solo display. It's a pity a training pairs formation couldn't have been flown with the available types - an opportunity missed. But we would be seeing the Typhoon again later! Time to raise the noise levels with a show down between the Belgian and Dutch F-16 displays. The RNLAF playing their trump card by flying their Leeuwarden based Viper in a formation with the specially marked AH-64D Apache from 301 Squadron . This wasn't enough! The Belgian Fighting Falcon swooping off with the Lockheed Martin Cannestra Trophy for Best Flying Demonstration at RIAT by an Overseas Participant. There were display teams a plenty with the Red Arrows, Patrouille de France, The Patrouille Suisse, Jordanian Falcons plus the WeFly! Team from Italy. Women featured prominently with Major Virginie Guyot leading the French AF aerobatic team, whilst Flt Lt Kirsty Moore was flying with the Reds in her first season as Red 3. 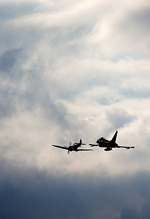 The lunchtime slot of the flying display saw the airborne tribute to the 70th Anniversary of the Battle of Britain. 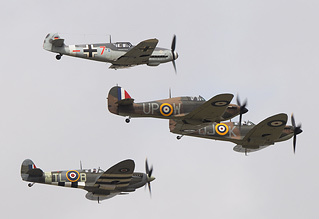 A multi-national flypast by aircraft from air forces involved in the battle was co-ordinated around the star item, the Messerchmitt Bf109G-4 from the EADS Heritage Flight, Manching, Germany. Following an impressive solo routine from the Boeing 757 of the Royal New Zealand AF, a moving missing man formation was flown by specially marked RAF Hawks from 19(R) Squadron - the first squadron to be equipped with the Supermarine Spitfire. The next part of the fast jet flypast saw a Tornado F3 of 111(F) Squadron join the Hawks, the 757 returning with two USAFE F-15C Eagles plus a third formation featuring a French AF Mirage 2000B escorted by two F-16s from the Belgian Air Force. The commentary team then fell silent for the purr of Merlin engines from no less than four Hurricanes and seven Spitfires. These WWII classics were sportingly joined by the Bf109G-4, Buchon and the Me108 in a memorable and moving tribute to 'The Few'. After remembering the past, Airbus allowed us a glimpse of the future in the form of the new A400M transport aircraft. 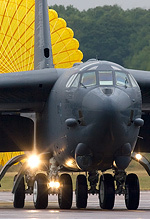 Supporting both the Fairford and Farnborough airshows, the Grizzly first flew into nearby Brize Norton to give the Royal Air Force a close and personal look at the aircraft - they have 22 on order. The display by the A400M was certainly impressive enough to reassure the nations that have ordered this versatile platform that they are onto a winner. The A400M really is a C-17 disguised as a C-130J! 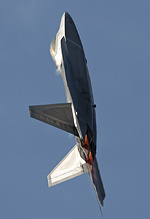 It was time to welcome the return of the Raptor to Fairford. F-22A Aerial Demonstration Team Pilot Major Dave 'Zeke' Skalicky from 1st Operations Group at Langley AFB in Virginia flew a breathtaking display. 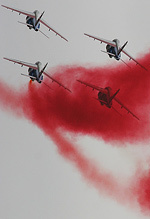 Picking up no less than three RIAT awards (King Hussein Memorial Sword, the Paul Bowen Trophy & As The Crow Flies Trophy) the routine featured power loops and unique manoeuvres designed to highlight why the Raptor can "dominate the air over any battlefield". Hot on the Raptor's heels was the F/A-18F Super Hornet courtesy of Boeing and the US Navy. Another Farnborough visitor, the Hornet bristling with under wing AMRAAM missiles, showed how noisy but manoeuvrable it can be, plus what made the F/A-18F the choice of the Australian Air Force as the replacement for its F-111 fleet. Following a battle of the bombers between the B-52H and Vulcan it was fittingly left to the Royal Air Force to close the flying display. Impressive Role Demo displays by a pair of Lossiemouth Tornado GR4s, Chinook and Harrier reaffirmed the RAF commitment to the Air Tattoo. It was great to see this noisy jump-jet hovering in front of the crowd again. Flt Lt Steve Kenworthy in the Harrier GR9 from 4(R) Squadron picking up the Sir Douglas Bader Trophy. The Steedman Display Sword was also a worthy prize for a well choreographed routine by the Typhoon and Spitfire pair from RAF Coningsby which brought an end to the RIAT 2010 flying display programme. With the Sunday display suffering due to weather it was a shame that the majority of the warbirds from the Battle of Britain flypast chose to head-off home rather than land back at Fairford. This was compounded on the Sunday by only the Hawks and B757 getting airborne - the rest of the fast jet element of the flypast cancelling because of the low cloud. On the ground, enthusiasts wondered why the best static aircraft photography position - the tree lined parking area at the west end - was not used. 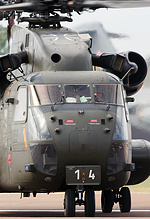 RIAT 2010 was an enjoyable affair with excellent variety, star items and fitting tributes. The themes for next year's show are 40th Anniversary of RIAT, Tiger Meet and Reconnaissance. With the drawdown in USAF personnel happening at RAF Fairford, 2011 being a non-Farnborough year plus massive cuts on the horizon for most European air arms, the Royal International Air Tattoo faces its toughest test yet. 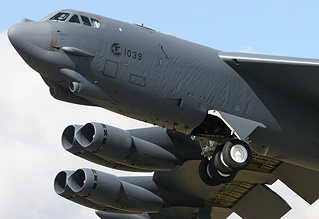 Royal International Air Tattoo 2011 takes place on the weekend of 16th-17th July at RAF Fairford.